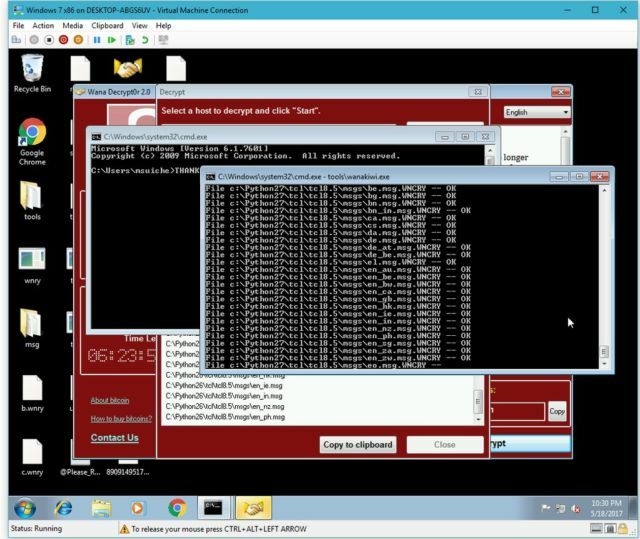 Like Wannakey, wanakiwi takes advantage of shortcomings in the Microsoft Cryptographic Application Programming Interface that WCry and other Windows applications use to generate keys for encrypting and decrypting files. While the interface includes functions for erasing a key from computer memory once it has been secured, previously overlooked limitations sometimes allow the prime numbers used to create a key to remain intact in computer memory. Those numbers can then be recovered as long as PCs remain powered on and the memory location storing the numbers isn’t overwritten with new data. As was the case with Wannakey, the recovery won’t work if an infected computer has been restarted. And even when an infected PC has remained powered on, the decryptor may not work if the memory location that stored the key material has been overwritten. Wanakiwi has not yet been extensively tested on computers with x64 CPUs, so it’s possible the tool doesn’t work as reliably on that platform. Despite the limitations, wanakiwi represents a major breakthrough that could provide invaluable relief for tens of thousands of people around the world.